West 7th is very well designed for both bikers and people who love to walk. 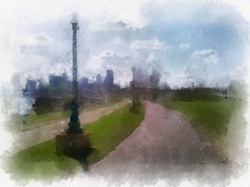 There are many bike paths that take you through downtown, and since they are all around the river they are very scenic. The bike path is also a gorgeous place to walk, with many places to stop and just sit or even have a picnic.